Educational Block Puzzle game is a classic tangram game for all ages. Block puzzle 2 solutions illustrated in this How to play Block Puzzle game guide will help you solve each tangram puzzle using the given methodology or strategy. If you can start your kids play the game with the first Block Puzzle games, the first levels which are easiest ones, they will love Block Puzzle. I believe these educational tangrams for kids are very useful for improving their mental capacities. 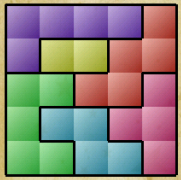 Block Puzzle 2 game is available in application market for both IPhone and Android smartphones. It is also possible for Windows users to play Block Puzzle 2 game by installing android emulator on their PCs and registering a downloaded Block Puzzle 2 apk file. The first 5 game levels of Block Puzzle is played on a 4x4 board. This square game board is the smallest board within the 500 available levels of Block Puzzle Tangram game. So to reach Block Puzzle 2 solutions in these first few games will be warming the player for next levels. If you can enjoy your children in the first 5 levels in Block Puzzle game, they will be willing to continue playing Block Puzzle for further steps. I know parents will like their children play educational games like tangram games where Block Puzzle is one of them. In the first 5 levels, shapes that the player must locate on game board are very well known shapes from Tetris game. But in the following levels, the board size will be changing in dimensions and generally in rectangular format. Besides different shapes will be included in the game that are not in the classic Tetris game. In order to complete each level, the tangram game player should place all shapes given into the game board. Items can not be placed on the board partially. All parts of the item should reside within the boarders of the board area. The player cannot rotate any given shape. In fact, this inability to rotate items is making the Block Puzzle game easier. Otherwise, if you have the possibility to rotate a shape the guess the correct layout would be more difficult. Now I can share my Block Puzzle solution strategy to complete each level in the shortest time with minimum trials. My first Block Puzzle hint is to start game with the largest shape given. The tangram player should start the Block Puzzle game with the biggest and ugliest shape displayed on the board. And continue playing with big and shapeless items in order. I can summarize this tip with "Eat the frog" saying. One Chinese proverb is saying that if you have to do something difficult, do it at once. When you place the most difficult shape available on the board, there will be very limited place on the layout for the second shape. And after placing the first item, there may be some places on the layout where none of the available shapes will fit. If this happens, move the first shape to another position. Finally you will find the correct position for the biggest and shapeless item on the board that will lead you for the Block Puzzle 2 solution. You will feel better with each solution in this wonderful tangram game. This game trick emphasizes that instead of starting Block Puzzle game level with a 2x2 square or a short rectangle in 2x1 dimensions, start with the following ledder shaped tangram item. As you will realize, there are empty squares around the item which might not be possible to fill with other game items available in the game level. So you can realize it at first without losing time that the assumed layout placement is not correct for the game solution. A second Block Puzzle 2 game tip for solution is being aware if sliding of item block will help you for the solution of the current game level. This trick is important when there is a long bar which is less than the width of the rectangle layout by one square. Don't forget that this game trick will be helpful only at the end of the level. 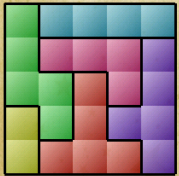 For example, Block Puzzle game level 15 is an example where sliding of item blocks can help the player to solve the tangram puzzle. Just keep an eye on the layout and think moving long bar from bottom to the top of the layout and moving all other blocks especially to make place for the small rectangular shape in 2x1 dimensions. In short to minimize the number of trials on the Block Puzzle layout, the game player should start the Block Puzzle game according to the first rule discussed here. And if the positioning of the items fail at the last shape on the layout, check if second rule will be helpful at the end of the game. Playing Block Puzzle tangrams for kids will be challenging yet enjoyable if their parents will guide them for the Block Puzzle 2 solutions where they require help. If hints for solution is not enough for solving a specific level please check Block Puzzle solutions for levels 1 to 20.